Ambition made her debut in France for Xavier Thomas-Demeaulte in a 2000m maiden for fillies.She ran well finishing 3rd and the trainer thought it was a good start. She will reappear in 4 weeks in a similar maiden. Cinnilla produced a large filly foal by Sea the Moon with on 06/04/2019. Sing the Anthem ran in a point to point bumper at Hereford finishing 2nd. He might conceivably reappear in 10 days in a similar event at Exeter. Amhurst was drawn 16 of 16 in a C2 handicap at St Cloud this afternoon and performed well. She was drawn wide and forced wide throughout the race but finished strongly. Her trainer was pleased with her performance and she will next run in a similar handicap over 2,400 meters. The extra distance should help. Pax American foaled a grey colt last night by Nayef who is a good size and quite correct. It is with sadness that I have to report the death of Ashbrittle. He was the first horse the stud sent to Ralph Beckett, which was the start of a fruitful relationship for us both. I remember Ralph phoning me in September of Ash’s 2 year old career suggesting we should have him gelded which made me think perhaps he wasn’t very good. As it was he ran 25 times, on the flat and over hurdles, winning 4 races and being placed 8 times.He took us to Royal Ascot twice and, on the second occasion, he was unlucky not to be placed and the Cesarawitch twice where he never threatened. He was rated 92 on the flat and 123 over hurdles. He was a flag bearer for the stud and we will miss him. Foaling is in full swing and Amhurst trained in France has an entry at Chantilly next week Tuesday 26th March in a hot handicap at Chantilly. A fabulous performance by Masar in the Derby was a feather in the cap for New Approach after a quiet spell. Prowess foaled a full sister to Talent by New Approach in May and we have sent Planete Bleue to New Approach this year although she is yet to test in foal. On the track Queen of Connaught finished 5th in the Lingfield Derby trial which saw her rated 90 by the handicapper. Richard Hughes who is training Ambition hopes to have her start off in a 6 furlong race by the end of June. This will be relatively early for a filly by Dubawi with the dam an Oaks winner and St Leger 2nd. Lets see how she goes. A home bred and owned filly Amhurst won a decent race at Toulouse trained by Xavier Thomas- Demeaulte who is in fabulous form at the moment training the 2nd in the Group 1 Prix du Jockey Club and a close up 4th in the Group 2 Prix Sandringham at Chantilly from his yard in Mont de Marsan in South West France. Talent foaled a Dubawi filly and visits Sea The Stars. Prowess foaled a full sister to Talent, by New Approach, and she returns to Frankel. Only Much Promise is left to foal and she will be rested for the season. On the racetrack a maiden win by Queen of Connaught, hopefully, sets her up to start climbing the handicap ranks over distances of a mile and a half or further. Good luck to Masar in the 2000 Guineas on Saturday, could New Approach be set for a comeback as a stallion? 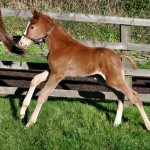 Our foal count now stands at 6 fillies and 2 colts. The most recent additions being a decent sized bay Sir Percy filly from a Dynaformer mare Silken Ocean and a chestnut colt by New Bay out of Singuliere a Singspiel mare. Breeding experts have identified that Dubawi, or his stallion sons, nick well with Singspiel mares. We shall see! On the track we have had slightly disappointing results with Hayadh finishing 9th in the Lincoln and then he ran down the field when following up very quickly in a Class 3 handicap at Musselbrugh. Joke Dancer ran well in defeat at Haydock in a 2mile Class 2 handicap hurdle. He was trying to win for the 3rd time in a row and as a 5 year old he has his future ahead of him and should make a good chaser next year. Allez Lou Lou foaled a large leggy filly by Eastern Anthem on the 22nd of March. Both mare and foal doing well. Talent arrived safely in Ireland and will be boarded with James Hanly at Ballhymkin Stud. Her Dubawi foal is due in 3 weeks time and thereafter she visits Sea The Stars. On the race track Brynmawr trained by the Tizzards was beaten into 2nd place in a handicap hurdle at Chepstow earlier in the week after an 8 lb rise in the weights to a rating of 120 following his maiden win over hurdles at Southwell, and we wish Hayadh the best of luck in the Lincoln Handicap at Doncaster tomorrow. The Cheltenham Festival is over and this marks the beginning of spring. You wouldn’t have known it as Ashbrittle had its second major dump of snow last weekend and roads were treacherous. The foaling season is underway and so far we have four fillies on the ground. An Authorized filly out of Driven Snow, a Siyouni filly out of Forte ( a full sister to Talent) A strong Oasis Dream filly out of Warling which makes her a full sister to Hayadh and an Anodin filly out of Pax Americana. Hayadh deserves a mention as he had a good two year old career when owned by Al Shaqab trained by John Gosden and after two years off the track was bought by Rebecca Bastiman. Rebecca trained him to win a competitive Class 2 handicap off a mark of 92 and he runs on Saturday at Doncaster in 7 furlong Class 2 Handicap off a mark of 95. After a considerable period with no updates to our web site I hope we can keep visitors to the site informed of news and comment throughout the season and look forward to sharing our highlights and lowlights with you. Some highlights of 2017 included a successful sale in Tattersalls Book 1 of a chestnut Frankel filly out of the wonderful mare Prowess and some minor winners in France. Ashbrittle Stud is also diversifying a little by identifying staying mares and breeding these mares to staying stallions. Some of these stallions would be considered dual purpose and if their progeny are too immature or too uncommercial for the yearling sales, Ashbrittle Stud will offer these horse at the DBS National Hunt sales. Our first sale, pursuing this strategy, was an Authorized gelding out of Missy Dancer. He was offered at the DBS National Hunt sale in 2016 as a 3 y.o. unraced gelding. Sue and Harvey Smith had some faith in us and bought the horse, now known as Joke Dancer, and he has won three times over hurdles for connections and is now rated 129. It looks as though he will go ‘chasing next season. The other highlight has been the arrival of Ivy, the first child of Ginny Whales, our Stud Manager, and Charlie Enticott her partner, early in the New Year. This is exciting for all of us connected with the Stud and we look forward to watching Ivy grow and develop into as fine a horse woman as her proud mother. All our foals are now on the ground and all are healthy and well. The final tally being 8 fillies and 4 colts. 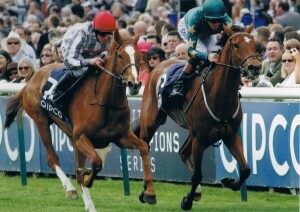 Of particular note both Prowess and Talent had fillies by Frankel and Dubawi respectively. On the racing front Matidia ran respectably in a maiden at Beverley finishing 2nd and is now rated 66 and puts this mark to the test at Brighton on 27th May. Forte has been gently tipping away with David O’Meara and will have a run shortly to see if she can be taught to settle in her races. In which case she might start to fulfil her early promise. Zilla will go back into training with Ralph Beckett and will be joined by Corn Law a full sister to Swaheen a 90 rated staying filly. A new year and a new season. Let’s hope it goes well and is an improvement on 2015. It looks as though we will have two, 2 year old, fillies in training in France with Xavier Thomas-Deameaulte namely FALCONRY a bay filly by Falco out of a Nureyev mare Carinae, and LAST POST, a bay filly by American Post out of an Anabaa mare Marie Baa. In the UK Ashbrittle will have a 3 year old filly MATIDIA by Manduro out of Caesarea, and 2 year old filly ZILLA by Zamindar out of Caesarea, in training with Ralph Beckett. FORTE will go back into training with David O’Meara in Yorkshire. It was felt she deserved another chance and that a change of scenery would do her some good. We will know our fate reasonably quickly I expect. She has strengthened up and let’s hope she learns to settle in her races. Shrinking Violet (ch.m Lets get Cozzy x Congaree) nearly repeated her win in 2015 at Santa Anita Monrovia Stakes Group 2. She was 2nd beaten a nose in the 2016 renewal. As a result of the successful mating to Congaree the mare is expecting a foal by Animal Kingdom in April to keep some Blushing Groom blood in the mating. The farm is gearing up for the foaling season and so far our mares have 3 produced fillies.Driven Snow (2006 g.m Linamix x In a Silent Way) has foaled a Hurricane Run filly, Mamabo Gold (Medaglio D’Oro x Mambo Jambo) has foaled a HolyRomanEmperor filly and Planete Bleue (Dansili x Ploughkeepsie) has foaled a Siyouni filly. A long overdue catch up on a slightly disappointing season. Forte, who was our brightest prospect, ran disappointingly in the Pretty Polly and we decided not to run her in the Oaks. She next appeared in the Ribblesdale Grp 2 at Royal Ascot. Ralph Beckett was confident she would outrun her substantial odds, judging by her homework. She duly ran an excellent race finishing 6th beaten a short head by Gretchen, having given the field 4 lengths head start. Forte puts her credentials on the line in the Pretty Polly sakes at Newmarket on Sunday. She is following in Talent’s footsteps, her full sister, who, of course, won this race prior to her win in the 2013 Oaks. Cinnilla has entries in a number of group and listed events, over extended distances, and Silken Ocean is entered in a 1 1/4 maiden at Salisbury. On the National Hunt scene Ashbrittle makes a long awaited comeback at Uttoxeter on Saturday 2nd May. How he runs there will determine whether we persevere with him or he has a well earned rest. Tendon injuries are difficult to recover from. Pax Americana ran encouragingly at Toulouse and finished 5th in a listed event won by a Lope Da Vega filly, Mojo Risin, who will now receive an entry into the French 1000 Guineas at Longchamp. Lots to catch up on. The racing season is underway and Ashbrittle Stud owned and bred horses have been in action. Cinnilla was 4th in the Further Flight Stakes Listed at Nottingham and hopefully runs in a Group 3 contest at Longchamp in early May. Pax Amrican won her maiden at her second attempt and then ran a very promising 3rd in a good conditions race at Toulouse. Pax Americana ran against some very well regarded horses and will try her hand in a listed race inToulouse on the 23rd of April. Singular Quest ran well but finished 3rd in a Class 5, 0-75 handicap at Beverley. He will get his head in front before long. Foaling continues with the count now 7 fillies and 2 colts. Unfortunately Prowess foaled a large filly which didn’t survive. The mare has coped well and has just been covered by Frankel. Talent has just been covered for the 3rd time by Dubawi so we are on count down and hoping she is in foal. The team are busy now that the foaling season has started. So far we have had 5 foals, 3 foaled at Ashbrittle, one in Ireland at Barnane Stud, and one in France at Jedburgh. All the foals are healthy and the mares are all in good shape, too, after their exertions. I t must be the water here at Ashbrittle as all 5 foals are fillies! We have a short lull now until the middle of March when Prowess our star mare foals to New Approach.We are all hoping for a colt which will be a full brother to Talent. We will update you as soon as we know. Ashbrittle Stud started the new year with a stakes success in the USA. Shrinking Violet(ch.m 2008, Congaree x Lets Get Cozzy) bred by Ashbrittle Stud won the Group 2 Monrovia Stakes at Santa Anita. This win has taken her her career winnings past $350,000. Fingers crossed she continues to improve and hopefully she might be given a chance in Group 1 company for her owner and trainer Wesley Ward. Singular Quest will run at Lingfield on the 30th of January and hopefully will win her maiden. Meanwhile down in Somerset the team are waiting for the first foals to be born. Alla Prima and Pompeia are imminent and we will keep you un to date with the foals as they are delivered. Happy New Year to all and everyone at Ashbrittle Stud is looking forward to 2015. Our horses in training returned to Ralph Beckett yesterday a signal the season is underway. 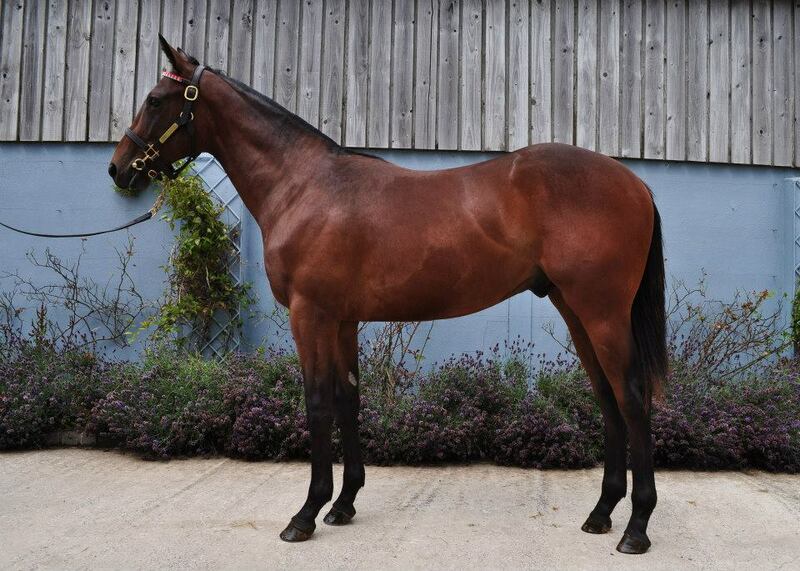 Singular Quest, a first foal colt by Dalakhani out of Singuliere, ran with promise finishing 5th in a 1m maiden at Lingfield just before Christmas and was an unlucky 2nd beaten 1/2 length in a 1m 2f maiden again at Lingfield on Saturday 3rd Jan. We will try and get her to win a similar maiden and then give her some time and wait for the firm ground which will suit her. Staying will be her game. Other news of note was a first stakes win in the G2 Monrovia Stakes at Santa Anita on Sunday 3rd of January. Shrinking Violet was bred by Ashbrittle Stud in the USA being by Congaree ( the best colt produced by the great Arazi) out of an Ashbrittle Stud mare Lets Get Cozzy. Also Arcange a 2 year old filly by Arcano out of Carinae won another race at Deauville in France and Firdous ( Cape Cross – Alla Prima)who ran a few times in France as a 3 year old picked up the thread and has won a couple of times in decent company in Qatar. There has been little of note to report since Forte ran in the Group 1 Fillies Mile at Newmarket and Cinnilla finished 8th of 11 at St Cloud in a listed race.I think it was the end of a long season for her and she needs a rest at the farm.Two of our late developing 2 year olds had an introductory run at Lingfield on the 26th of November. Singular Quest, a Dalakhani colt, ran with some real promise and we are looking forward to him running over 1 1/2 miles in time next season. Silken Ocean ran in snatches and has a lot to learn. We hope she improves next year and being by Dynaformer there is every chance she will. Ashbrittle Stud also picked up a mention in The Golden Gavels, which are bloodstock awards for 2014, in the International Thoroughbred magazine for December 2014. Ashbrittle Stud was awarded Farm of the year for the production,preparation and selling of the Galileo colt out of Penang Pearl which was the most expensive yearling sold anywhere in the world in 2014. The stud has a lot to live up to in 2015. Forte is back at Ashbrittle Stud and is enjoying her break. She ran creditably in the Fillies Mile at Newmarket beaten 5 lengths but she will have learned from her first start on grass. She was still very green and after being slowly away she raced too keenly, and then when the race began in earnest up she became unbalanced in the dip before running on again. Cinnilla will try for some black type in a listed race at St Cloud in mid November and two 2 year olds, Singular Quest and Ocean Silk, will have introductory runs on the all weather before being put away until next year. Our Sir Percy sold well at Tattersalls Part 2 and Ashbrittle Stud has a filly yearling which sells tomorrow morning in Book 3. Forte definitely runs in the Group 1 Fillies Mile at Newmarket tomorrow. She is the least experienced filly in the race and we hope she is not overmatched and runs creditably. Too much to ask for lightening to strike in the same place twice! Fingers crossed. Today is a bit of a comedown from yesterday’s incredible high.Imagine the feeling when the Galileo/Penang Pearl yearling colt is walking around the ring at Tattersalls sales and the auctioneer is struggling to get an initial bid at 5,000 guineas. This is after the horse has been vetted by 5 different potential buyers, each of which is a known big hitter, and after Coolmore, in the shape of Magnier, Shanahan and Aiden O’Brien, have looked at the horse more than once. Ginny Whales comment that she wanted “the earth to open up and swallow her and the horse” is quite apt. I was in the sales ring below team Coolmore and people around me were asking if there was something wrong with the horse! Thankfully a bid of 5000 guineas was the start of a bidding war which ended with John Magnier offering 2.6m guineas,on behalf of Coolmore, to secure the horse.A big thanks to Coolmore and we wish them the best of luck with the horse and hope that he becomes a champion like his half brother Harbinger. Thanks also to Nick Ooi who owns the mare Penang Pear and who has the confidence to board his mare and her valuable offspring with us at Ashbrittle. A fantastic effort on behalf of everyone at Ashbrittle Stud, all of whom played their part, plus, of course, our vet James Bosley and farrier Mike Smith.However a special mention to Ginny who oversaw his preparation and made sure the colt arrived at Tattersalls in fantastic condition. 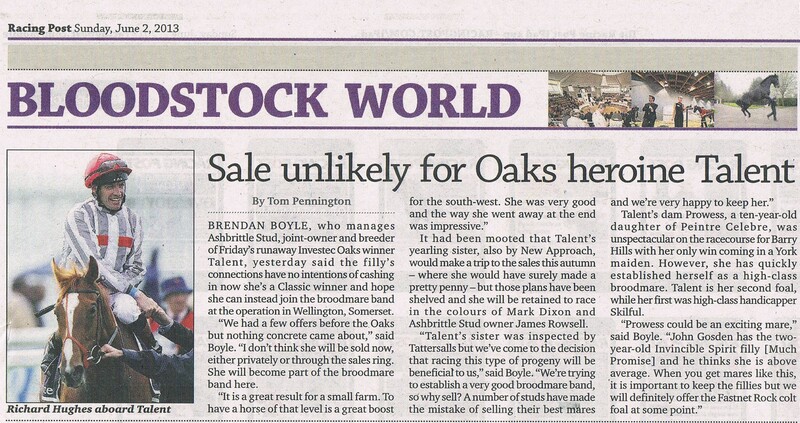 Back to he slightly more mundane business of horse racing and the rest of the sales. 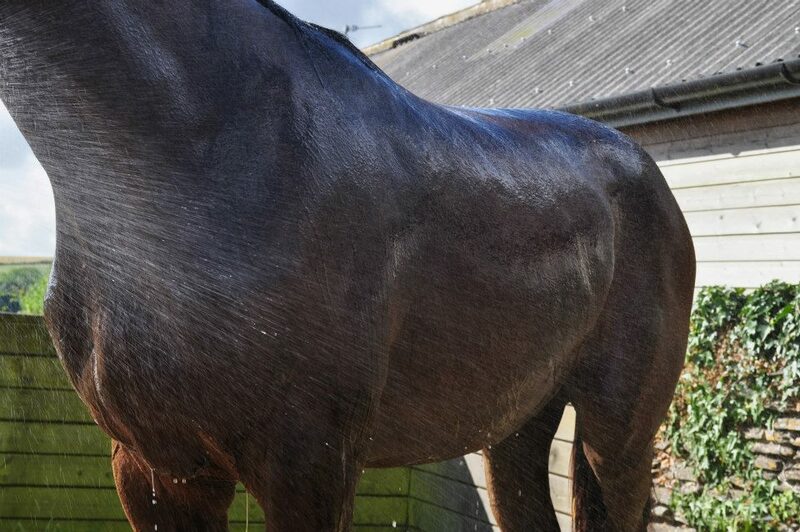 Cinnilla has been drawn 16 of 24 in the valuable 1/1/2 mile handicap at Newmarket on Saturday.She is quoted at 25-1 and every drop of rain that falls between now and then will be in her favour. Louis the Pious finished in 3rd place in the Group 3 John Guest Bengough Stakes at Ascot on Saturday earning his first bit of black type. This is a timely update to the pedigree of Whole Grain before the Tattersalls yearling sales. Forte faces some well bred newcomers in her race at Kempton tomorrow evening, and Cinnilla has an entry for the 1 1/2 mile3 heritage handicap at Newmarket on Saturday. 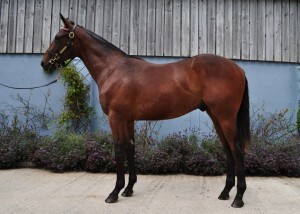 Tattersalls sales are next week and Ashbrittle Stud is consigning three yearlings.Photos are available to view on this website and the book 1 Galileo/Penang Pearl has a video clip posted online at www.tattersalls.com.Let’s hope we can get them all there without any problems! Louis the Pious has entries in two 7 furlong races, one a listed affair and the other a Group 3 and we are looking forward to Forte running next Tuesday at Kempton Park. We hope Cinnilla will take her chance in a 1 1/2 mile handicap at Newmarket on Cesarawitch day the 11th of October. Louis The Pious (Holy Roman Emperor/ Whole Grain)trained by David O’Meara and ridden by James Doyle,comfortably won the William Hill Ayr Gold Cup on Saturday.Louis The Pious is the first foal of Whole Grain, a full sister to Irish Oaks winner Pure Grain. 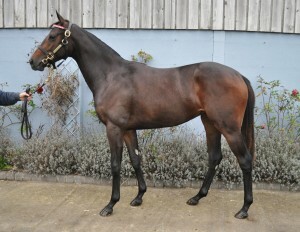 Ashbrittle Stud is offering a Sir Percy/ Whole Grain colt yearling at Tattersalls Book 2 on Monday October 13th. 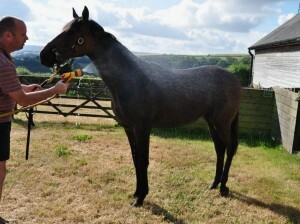 A picture appears on the web site under Horses for Sale.The mare has a Lawman filly foal which will be retained and the mare is in foal to Holy Roman Emperor.Hopefully Lois The Pious will go on to secure some black type for the mare as the handicapper will probably raise him a few pounds from his current mark of 104. Cinnilla followed up her win at Salisbury with another good win at Cheptow on Friday 5th September over 12 furlongs by 3.5 lengths.She ran off a mark of 74 which included a penalty for the win but before her handicap mark was adjusted. She is now rated 80 and we will be looking for a suitable handicap in October before the horses in training sale at Tattersalls.Timeform assessed the performance as superior to her win at Chepstow and Cinnnilla looks as though she is still on the upgrade. Talent has returned home and is settling in once again at Ashbrittle Stud. She is sharing a paddock with her half brother Skilful, who is recovering from his tendon injury, and an unraced filly Mambo Gold. We were all disappointed that Talent didn’t quite show the form and sparkle of her 3 year old career, as a 4 year old, but she was at her best when it really mattered. Many thanks to Ralph Beckett and his team at Kimpton who have done such a great job with her and who have handled her so sympathetically. When mating plans for Talent are confirmed we will let you know. Cinnilla turned in a much improved performance on Friday evening the 29th August at Salisbury and won a one mile six furlong handicap off a mark of 67 in a canter by 9 lengths. She will probably run again at either Chepstow or Haydock on Friday 5th September before the handicapper puts her up in the weights. We are hopeful she will run well again but don’t want the ground dry out too much. The key to this filly is the trip and a bit of cut in the ground. Talent ran creditably in the Lilly Langtry Group 3 and after looking like she would be in contention but possibly found the ground too firm. She came out of the race well and has only lost 6 Kilos in weight. The plan is to persevere with her and look for some softer ground. Races being considered include the Prix Vermeille and the Qipco Fillies and Mares race at Ascot in October. Her full sister Forte is close to a run and we will update when there are firm plans for her. Cinnilla is entered at Newbury on Sunday in a fillies only handicap. She needs to get her head in front as she is due to be offered for sale at the Doncaster Sales in early September. 13/03/14 We had eight of our maiden heifers go to the Red Ruby Devon’s spring show and sale. They all past their Tb test, a couple of days previous, and they all sold for good prices. 09/02/14 Jump Ship foals a Ch.c by Compton Place. 27/12/13 All the race horses go back into training after there winter holiday here at the stud. 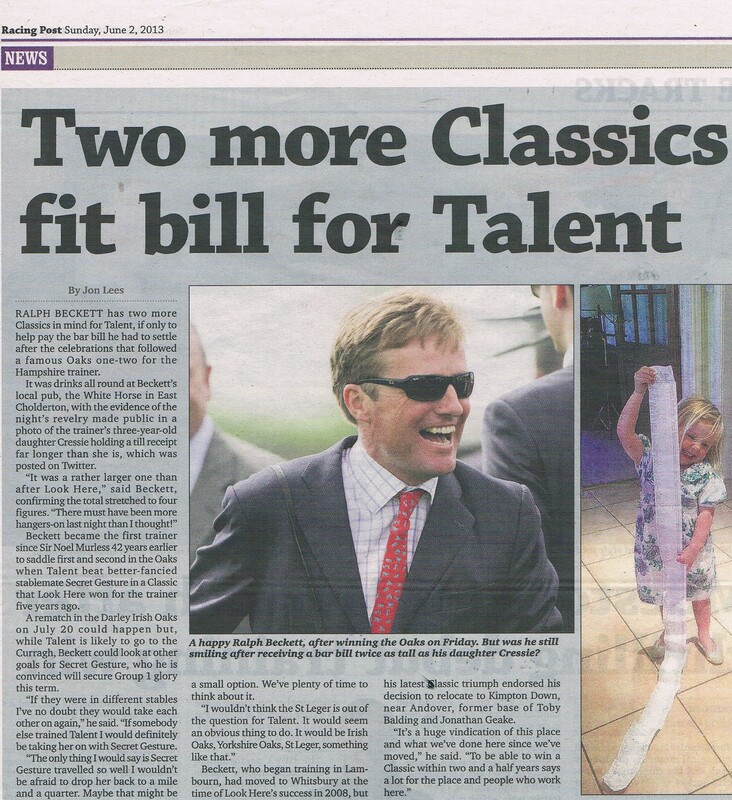 Talent, Forte, Singular Quest, Cinilla and Mambo Jambo ’12 to Ralph Beckett, Much Promise to John Gosden. December Foal Sales – We had a very successful Foal sale at Tattersalls with our top lot Fastnet Rock x Prowess 2013 selling for 320,000 guineas to Demi O’Byrne. 01/09/13 October Yearling Sale: Book 1 Horses Bathed, Plaited and shod ready to leave on Friday don’t forget to check them out on out Horses for Sale page!! 24/08/13 Doncaster Premier Sales Horses Bathed, Plaited and Shod ready for the next four days. 19/06/13 Another win for THWART (Ch.f Refuse To Bend x Jump Ship) yesterday at Kempton in the 8.40 Fillies’ Handicap ridden by Jim Crowley. 12/06/13 Slightly disappointing run from Pompeia, she will be tried over a mile-and-a-half as her breeding suggests that trip. 11/06/13 POMPEIA runs today at Salisbury in the Fillies Handicap Stakes at 3.30, ridden by Jim Crowley trained by Ralph Beckett. Good luck Pompeia! 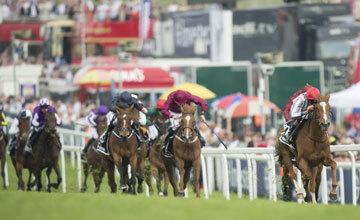 03/06/13 TALENT wins the ‘Investec Oaks’ at Epsom on Friday!! A fantastic result for the co owners Mr. & Mrs. Mark Dixon, and the owner of Ashbrittle Stud Mr. James Rowsell. The stud would like to thank the trainer Ralph Beckett and all of his team at Kimpton Down Stables for all of their hard work, and also to Richard Hughes for giving Talent such a great ride. 22/05/13 POMPEIA comes a respectable second yesterday at Nottingham. 21/05/13 DRAHEM (B.f 2010 Teofilo x Carinae) wins the Maiden Fillies’ Stakes at Redcar yesterday for trainer James Fanshawe, a filly we bred, and then sold as a yearling through Tattersalls in Book Two in 2011. 20/05/13 POMPEIA runs tomorrow at Nottingham in the Fillies Handicap at 3.50 ridden by Jim Crowley trained by Ralph Beckett. 08/05/13 THWART (Ch.f Refuse To Bend x Jump Ship) wins at Kempton yesterday in the 4.10 Fillies’ Handicap race, and is entered at Nottingham on Friday. Owned and bred by our long standing owners Mark & Diana Dixon, & trained by Ralph Beckett. 07/05/13 TALENT wins the Pretty Polly Stakes at Newmarket on the 5th May, trained by Ralph Beckett ridden by Jim Crowley. PENANG POWER (B.f Manduro – Penang Pearl 2010) owned and bred by our long term owner Mrs A K H Ooi, runs today at Sandown in the 4.25 against SKATING OVER (Ch.f Giant’s Causeway – Annie Skates 2010) a filly we bred & then sold through Tattersalls as a yearling in 2011. 23/04/13 POMPEIA runs a respectable race last night finishing third at Windsor, trained by Ralph Beckett ridden by Jim Crowley. 22/04/13 POMPEIA (Ch.f by Singspiel – Caesarea) runs today at Windsor at 6.00pm. 02/04/13 ALL ANNALENA (B.m Dubai Destination x Alla Prima 2006) wins her handicap hurdle race at Towcester on the 31st March trained by Lucy Wadham ridden by Leighton Aspell. 18/03/13 PROWESS foaled a B.Colt by Fastnet Rock on the 17/03/13 , she will be bred to Invincible Spirit this year. 15/03/13 PENANG PEARL foaled a B.Colt by Galileo on the 09/03/13, she will be covered by Galileo again this season. 04/03/13 PEACE AND LOVE foaled a Ch.f by Equiano on the 02/03/13, she will be returning to Equiano again this season. 01/03/13 LET’S GET COZZY (1994 Gr/Ro.m by Cozzene – Sweet Lassie) foals a chesnut filly on the 27/02/13 by Street Hero. This mare we have in partnership with Hartwell Farm in Kentucky USA, run by Robbie & Susie Lyons. 28/02/13 A respectable 2nd for GRAND EXIT (B.m 2006 by Exit To Nowhere – Little Feat) yesterday at Wincanton in the Mares’ Novices’ Hurdle, trained by David Pipe ridden by Tom Scudamore. 07/02/13 WARLING foals bay colt by Oasis Dream & CAESAREA foals chestnut filly by Manduro both born Monday the 4th February under the care of Toby Barker at Broughton Bloodstock. 25/01/13 NINA FONTENAIL and her filly foal by Compton Place, out in the paddock enjoying the snow! 24/01/13 FACEBOOK – Thank you to all of our followers on facebook, we now have 500 fans!! !